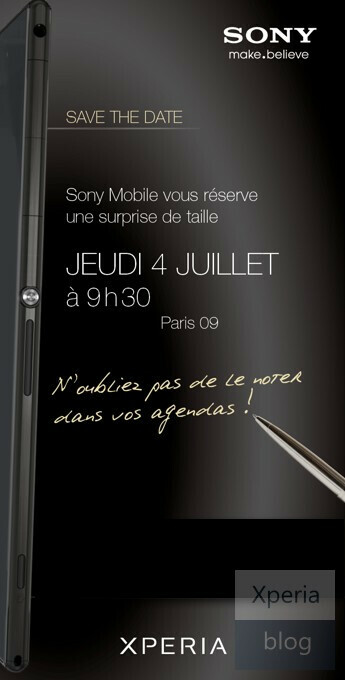 What could very well be the smartphone with the largest screen on this planet, was used on Sony's invitation for its July 4th event in France at 9:30am. The invite shows a sideways view of what is believed to be the 6.44 inch Sony Xperia Z Ultra. And it sure looks like this device is not only big where it counts, but also cuts a svelte figure at 6.5mm thick. The earphone jack will be on the side of this model and there is even an opening for a lanyard. The use of a stylus in the ad seems to indicate that the Japanese OEM's big boy will come with some sort of pen-based input. The phone also is expected to be water and dust resistant. The rest of the rumored specs are top shelf indeed, starting with the 6.44 inch 1080 x 1920 Triluminos display. Powering the phone is a quad-core Qualcomm Snapdragon 800 processor with 2GB of RAM and 16GB of internal storage.The latter can be expanded with the use of the included microSD slot. Back and front snappers weigh in at 8MP and 2.2MP respectively. Android 4.2 is said to be pre-installed. The invite states that "Sony Mobile reserves a big surprise for you" (emphasis ours). The question mark is whether Sony can find a U.S. carrier to add the Sony Xperia Z Ultra to its lineup. The competition, like the Samsung Galaxy Note 3 and the HTC T6, will both be offered by stateside operators offering subsidized pricing. And for those wondering how the device can be water resistant with no covering for the headphone jack, take a look at those Motorola DROID RAZR models that come with the water resistant splash guard. These devices are coated using nanotechnology inside a vacuum chamber, and even the electrical circuits and ports are treated. With the improvements that we have seen in treating smartphones to handle water, the Sony Xperia Z Ultra will probably be able to withstand a drop into the toilet. ok arent we reaching tablet size now? when will they realize that anything reaching 6 inches is just too big. People seem to b itch just for the sake of b itching. If you don't like it don't buy it. I'd rather have the choice of picking up a super large phone than being limited and held back. That's what Android phone manufaturers are about. If you still have momma dressing you let me recommed an iPhone. If consumers don't want larger phones then they wouldn't buy them. The only reason manufacturers are even offering such devices is because there is a demand for them. As long as there is a high enough demand, manufacturers will pour their resources into that type of product. Samsung first introduced the world to the "phablet" with the Note partially because they had enough funds to be able to take a risk if the product didn't sell well. What happened? The consumers voted in favor of the new product line with their wallets. Now you have manufacturers like LG, HTC, and Sony that have seen the success of phablet devices and are creating their own in the hopes of achieving the same success. In the end, it's the consumer that decides the success or failure of a product. Specs aren't everything. Remember that a larger screen mean more pixels to punch and more screen area to cover. That leads to requiring more CPU, GPU and RAM power to run the device. Although the Ipad 2 has basically the same specs as the iPhone 4, it is a lot more laggy. the galaxy note 2 was hard enough to fit in your jeans, now imagine a 6.4 inch phone with sharp edges, it would feel so uncomfortable especially when u sit down. It is not really made for calls but for daily use, offering a lighter than ever ipad mini experience. Are you thinking of putting your ipad mini inside your pocket? But w/ that being said though, there's still ample good arguments to be made on the necessity of the extra .44 inches? can ipad mini make phone calls? and the sony xperia Z ultra is a phablet,so it would most likely have the same UI as a phone instead of a tablet, meaning its more intended to be used as a phone than a tablet. This phone is meant to compete with the galaxy note 3. Maybe of more use to executives who can put it in their jacket pockets and always need to carry around something to jot stuff down. I am a huge Sony fanboy. I love the specs and the look, but even I think this phone is just too big. This is not a phone, but a phablet. To bad not a bit better camera but still interesting hope this makes samsung think about the specs on the note 3 now. good specs,but i dont think its sand proof..(headphone input) toilet sure will be nice.wonder when honamy comin. Nice but, too small for LeBron and Shaq. Still waiting for the detailed and confirmed specifications of Sony Honami. 6.44 inchess is too big for me. do you want aluminum condoms too ? I remember people taking photos in front the mirror with big azz devices..I think it's stupid to call a 6'44" a phone... Ain't enough big foot's on this planet to generate some benefits off this Sony production.